Some chefs have all the luck, and Chef David McCann of The Earl of Thomond Restaurant indeed possesses very good luck, along with dedicated passion and talent. 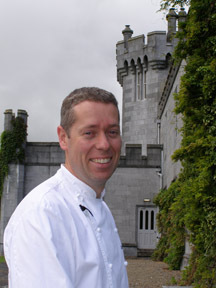 For starters he has great credentials, after attending college in Kerry, classically trained in French cooking, he began his career at The Shelbourne in Dublin, followed by stints at the Mirabelle and the Connaught Hotel in London, before settling in at Dromoland Castle Hotel & Country Estate where he has been tantalizing the guests' taste buds for the last twelve years. His hard work has earned him many awards including the "Award of Excellence" by the Academie Culinaire de France, finalist in "UK Chef of the Year" and he won the "Grand Prix Pierre Tattinger Competition." Suffice it to say the man can cook. During my stay at Dromoland Castle Hotel & Country Estate in September 2007, Chef David took time from the kitchen to tell me about his many gardens on the grounds for his disposal including herb gardens and a walled vegetable garden. In addition, he uses local growers, two of which are organic farmers, to supplement anything else that he needs. The restaurant features all Irish cheeses, as well as Irish beef and lamb. The veal is generally organic, and when he can get it, local. The fish is mostly Irish, with the possibility of imported bonnet, a type of tuna on occasion. His menu is ambitious and well presented with major changes 3-4 times per year, and the Table D'hôte menu continues to evolve with the seasons. While I was there, the venison season had just started and he was looking forward to creating new recipes. When not busy creating new recipes, or making his monthly appearance on Irish television, Chef David is very much a family man and can be found at home with his wife on the grounds of the estate playing with their children. Method: Peel the potatoes, cook in salted water, drain well and mash. Chop the chives. Bring the butter and cream to the boil, season with salt and pepper, add the mashed potatoes and mix until smooth and light in consistency. Add the chives just before serving and correct the seasoning. Method: Place the juice, sugar, crushed star anise and shallot in a saucepan and reduce to 4 tablespoons, pass through a fine strainer, re-boil and whisk in butter, correct seasoning. Method: Peel and chop the garlic and trim and slice the scallions. Heat a good-sized pot, add a tablespoon of olive oil and knob of butter, and immediately add the scallions and garlic, and then the spinach, and season to taste. The spinach should be cooked just before serving, (just wilt the tender leaves). Method: Season the fish, heat the frying pan, add the oil and place the fillets skin side down. When golden brown, add the butter and flip the fillets over, add a drop of lemon juice. Drain well. Presentation: To serve, place the spinach in the middle of the plate, the potato to the side, the fish on top of the spinach, and drizzle the sauce around. Method: Mix together and let macerate for 1hour and place equally between 4 glasses. Method: Mix the lemon juice and lime juice together with the zest. Bring the sugar and cream to the boil, boil for 3 minutes exactly, add half the juice mixture stirring continuously, check taste, and then add the remainder of the juice to correct the taste. The mix will thicken slightly. Let it stand for 5 minutes, and then pour into the glasses and let set in the refrigerator for at least 3 hours. Method: Get your butcher to have the venison trimmed and clean. Mix the juniper, paprika, garlic and seasoning. On a piece of cling film, place one slice of bacon, rub with a little of the juniper mixture. Place the venison on top and roll on the bacon slice, wrap in the cling and tie both ends. Repeat for the second piece. Bring a pot of water to the boil and reduce to a simmer, add the venison, poach for 6 minutes (approximately) for medium rare. Remove from the water and rest for 5 minutes at least. Remove the cling wrap, heat the oil and add the butter, next the venison and colour on all sides, remove and rest again, for 5 minutes. Method: Simply wash, top and tail and slice the courgette. Heat the olive oil in a frying pan; add the courgette slices and season. Color both sides and drain; it only takes a few minutes. Method: Sweat the shallot in a little of the oil, add the sugar then the vinegar, reduce by 2/3. Next add the Soya Sauce and Pomegranate Molasses and warm through. Add the oil and diced tomato, and correct the seasoning. Presentation: To Plate, place the courgettes in a line, slice the venison and place on top of the courgettes and drizzle with the warm dressing. Method: Beat together until light and creamy. Method: Add to butter and sugar mixture. Method: Sift the flour and almonds together, add to the mixture and mix gently. Method: You can buy good butter puff pastry in the supermarket these days. Roll out on a floured surface and cut into 10 cm (4-inch) discs. Spread each with the raspberry jam, leaving a 1 cm (0.4 inch) border. Cover the jam with frangipane to a 4 mm (0.16 inch) depth. Next cut the figs into sixths or eighths, depending on size. Arrange the fig segments on top of the frangipane and dust with sugar. Bake at 180° C (350° F) for 11 minutes. When baked, remove from the oven and dust with icing sugar again. Method: Roll the pastry, line the mould leave plenty to overlap. Prick the base lightly, line with cling film and beans, chill for at least 20 minutes. Preheat the oven to 180° C (350° F), bake the pastry for 10 minutes to set pastry, remove cling & beans, time the edges and patch any holes. Brush the inside of the pastry with egg wash and return to the oven for approximately 5 minutes at 130° C (266° F). Method: Chop the chocolate, place in a bowl. Bring the milk and cream to the boil and pour over the chocolate. Whisk the mixture until all the chocolate has melted. In a separate bowl place the beaten eggs, add the chocolate mixture and whisk well. Strain through a fine sieve. Fill the flan to the very top with the chocolate mixture. Bake at 130° C (266° F) for 25 minutes, switch off the oven and leave for 30 minutes more. Please read other articles on Dromoland Castle Hotel & Country Estate in the Hotels and Resorts, Restaurants, and Spas sections. Please read other articles on Ireland in the Destinations, Hotels and Resorts, Restaurants, Chefs' Recipes, Liquor Cabinet: Celtic Crossing Liqueur, Boru Vodka, Knappoque Irish Whiskey, Fashion, and Adventures sections. For information on Ireland, please visit the websites: Discover Ireland, www.DiscoverIreland.com or call them at +1-800-223-6470. For driving directions in Ireland, visit www.aaireland.com.